If you’ve played Warframe during the past couple weeks, you may have heard a mysterious new voice, transmitted from your Orbiter’s Scanner, suddenly talking a lot of conspiratory… sense. The voice is Nora Night, and the radio frequency is Nightwave, the new game update we’re delivering today across all platforms. This simultaneous multiplatform content update is a first for the Warframe team, so we’re incredibly proud and excited to offer it to you today for free! Nightwave is Nora Night’s all-new ongoing radio broadcast. Her conscience-burning questioning of the ‘System’ and poetic monologues about life in the Origin System play out like a kind of radio drama series. Nora’s stories consist of Series and Episodes. Think of a Series as a season with a beginning, middle and end, with earnable exclusive rewards specifically tied to each one. In each Series, you’ll play through a number of Episodes, each one coming out every two weeks or so, across a roughly 10-week period. The first Series, “The Wolf of Saturn Six,” tells the story of a savage and unruly convict who has escaped from captivity. Now he’s out there, freely prowling the Origin System, and you, dear Tenno, must put an end to it! Here is where it gets more nitty-gritty. 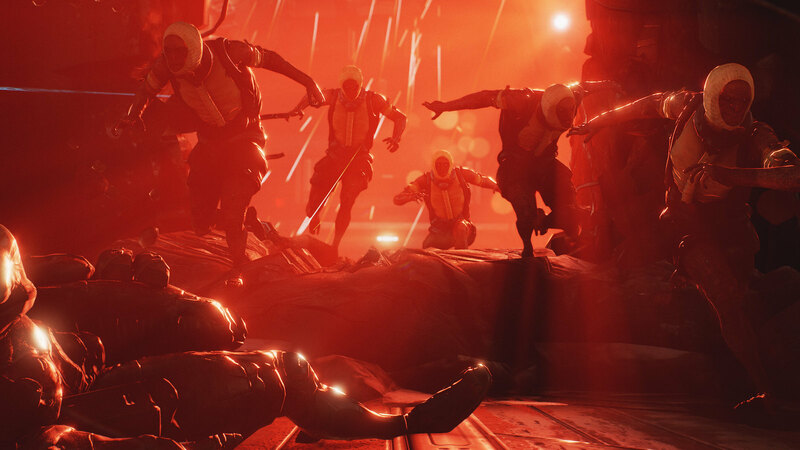 Nora offers daily and weekly challenges, called Acts; as you complete an individual Act, you’ll earn Standing with her, similar to the way you earned Standing with other Syndicates in Warframe. The more Standing you earn, the better Reward Tiers you unlock. Make sure to complete all 30 Tiers before the Series is over to earn all rewards! Some of the power items you earn have never, ever been available before, so this is an incredibly opportune time to jump into Warframe and earn these exclusive items. 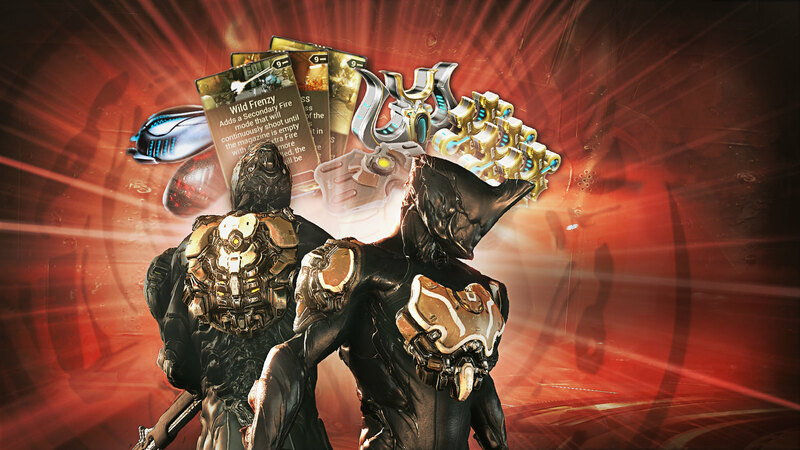 Rewards range from exclusive Cosmetics, such as Armour, Sigils and a Syandana to exclusive and highly sought-after Power items such as a Warframe slot, Umbra Forma, Forma Bundles, Weapon Slots, Orokin Catalysts, and a lot more. By reaching Tier 4, for instance, you’ll earn things like two weapon slots; by reaching Tier 26, you’ll have access to the Wolf Howl Emote; and by overachieving at Tier 30, you’ll earn the Saturn Six Armour Set, the signature battle armour of the only lunatic fearsome enough to have escaped the Saturn Six Max-Pen. Some Tiers contain items called Wolf Cred, a new token currency. 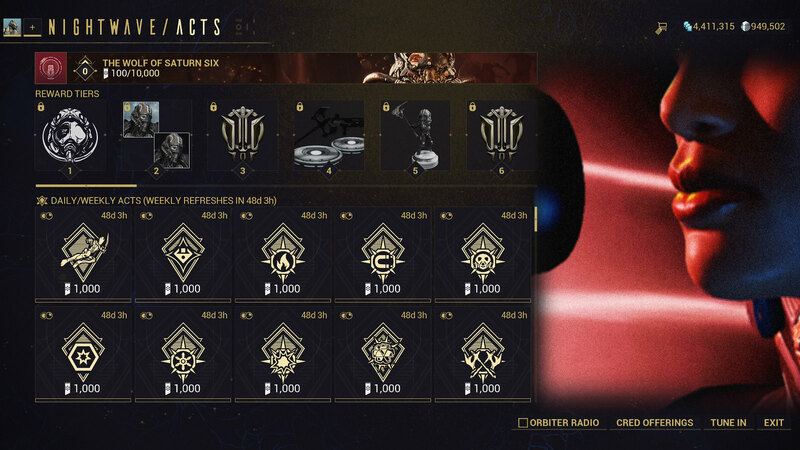 These can be used in Nightwave Cred Offerings, a shop that rotates through the former Alert System rewards you want the most. Wolf Creds must be redeemed before the Series is over or sold for credits, so use them before the frequency is lost. But take note! Once the Series ends, it’s done. There is a very real immediacy to each one! If you play, you’ll get as much Power and Cosmetic goodies as you can earn. Nora will then commence on a whole new Series, with its own distinct set of characters, story, lore, incentives and rewards. All of this is happening today across all platforms! If you haven’t already heard her musings from your Transmitter yet, we encourage you to log in and listen on your PS4. Not only is it cool to hear Nora’s warm, commanding, velvety voice in the chamber of your Orbiter, but she will continue to bring new stories, gameplay, and rewards from the Origin System, directly to you in the future! I feel like a donkey with a carrot tied in front of my face. Sounds awesome! Early impressions of this for me are VERY good indeed. One easy daily challenge and a few not too difficult weekly ones you will get without too much effort or grind during the week. The couple of 'Elite' weekly challenges are obviously much trickier but do-able. The tier rewards look very nice if you bother to put the time in and the "Credit" rewards give you scope to choose what you want to go for. Unsure on limitations for better rewards from here as to how often you can get them or what the refresh does but will find out in due course. A very intriguing take on the previous Alert system that has been around pretty much since the games' inception. I really like the nightwave stuff, I'm using weapons that have been sat in my inventory and not been used in ages in different set ups to complete the challenges.